This recipe features the classic pairing of pork chops and applesauce. Be sure to ask your butcher for bone-in pork chops since cooking pork with the bone attached makes the final product so much more juicy, tender, and flavorful. Meanwhile, the apples will soften in the MultiPot pressure cooker and infuse their succulent juices into the pork. Also, using thick-cut chops keeps the meat from drying out in the pressure cooker. This recipe will be a fun way to shake things up on weeknights. Best part is, the dish is ready to eat in 20 minutes! If you can't find pork stock at the grocery store, you can substitute chicken or beef stock instead. Just before serving, top each pork chop with a few additional turns of freshly ground black pepper. Per Serving: 175 calories; 6g fat; 26.2g carbohydrates; 7g protein; 16mg cholesterol; 631mg sodium. I admittedly wrecked my first attempt at this because the chops were too thin. Meat was too stringy and dry. Second run was sublime. I used apple cider instead of pork stock, because who has pork stock?! Went well with baked sweet potatoes, though will bake russets next time because sweet potato plus apples was a little too sweet overall, but the sauce was great on those sweet potatoes. I guess I'm conflicted. This recipe is crazy good. For this one I used really thin sliced porkchops so they were very juicy and not dry at all. The combo of the pork chops with apples and the CUMIN (which tastes a bit like cinnamon in this pairing) really shines. I would recommend this recipe to anyone who wants to try a new pressure cooker pork recipe. 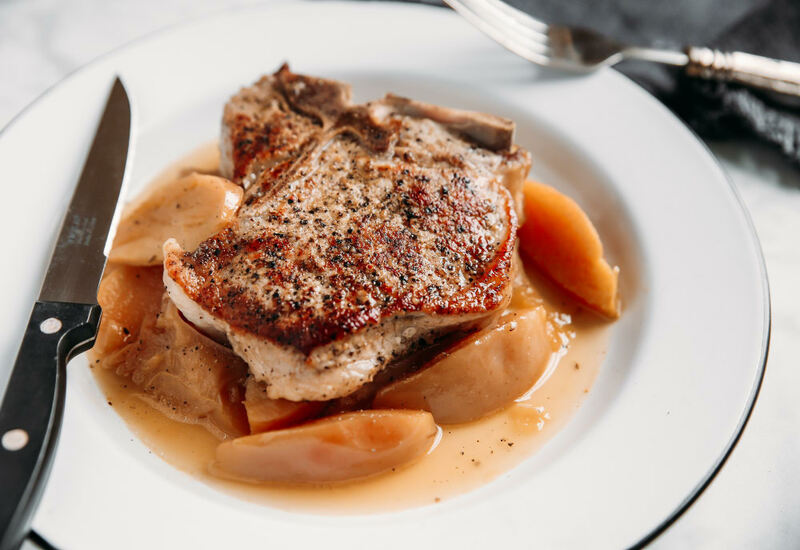 These pork chops with apples were light and delicious. It was really easy to make and perfect for a busy weeknight. I added a dash of cinnamon to this dish for a little sweet flavor. All in all, the pork chops and apples paired brilliantly together. This is for sure one of my favorite pork chop recipes. It wasn't dry at all and the flavor was incredible. I used chicken stock instead of pork stock, and it still was amazing. I used extra thick chops for this recipe! They turned out really good. That and the apples together were perfection. I wasn't sure how the cooking times would work out for both the meat and the apples, but I am yet again amazed at my Multipot and pressure cooking in general. I have now made stock, placed in flat plastic bags, it rocks! By gosh, I do have pork stock and veggie stock and chicken stock and beef stock as well as fish stock! This pot rocks and I am so glad I chose a Mealthy! Great site, excellent from scratch recipes, how could you lose? Thanks for such a great product! The pork was pretty tender but next I think I would use cinnamon and brown sugar. I used a crockpot express on this recipe. I’ve made this recipe at least five times and still love it. I’ve used both stock and apple cider and we like the flavor the cider gives it. I usually make asparagus with Parmesan and some brown rice. Definitely a great recipe! This was great! I used three thick, bone-in organic chops. I think the bone-in keeps it tender. I sauteed half an onion before I seared the chops, and added it back in with the apples (Fuji), and it tasted good. Used ground cumin, just ⅛ tsp, rather than seeds, plus a little cinnamon, suggested by another commenter here. I live at 7500 feet so added 3 mins to the time. Husband loved it... I had mashed sweet potatoes (not yams) and asparagus on the side. Groans of delight. I love my Multi Pot.